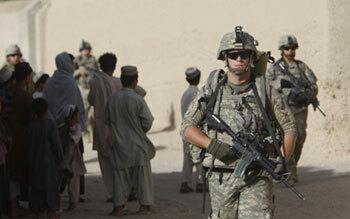 U.S. soldiers in Arghandab River valley, Kandahar Province, Afghanistan, September 8. Gen. David Petraeus, commander of the U.S.-led war in Afghanistan, said high casualties will continue for months as imperialist forces step up operations against the Taliban. The United Nations reports 1,271 civilian deaths this year, a 31 percent increase over last year. At least 500 U.S. and NATO troops have been killed. The total for all of last year was 512, including 317 U.S. soldiers. The number of U.S. troops killed so far this year is 323. Petraeus told reporters in Kabul September 3 that NATO forces are carrying out about 30 special operations attacks a day in Afghanistan, three times the number launched in Iraq at the height of the troop surge there. The focus of the effort now is Kandahar Province. Some 12,000 Afghan troops, 5,000 police, and 15,000 NATO troops have launched an offensive against an estimated 1,000 Taliban fighters in the Zhari district, where the Taliban was founded in 1994. Quickly driven out of Zhari when the U.S. invasion of Afghanistan began in 2001, the Taliban resurfaced there in 2006 and set up their own government, tax collection system, and courts. By May the Taliban had reestablished itself in Marjah and Gen. Stanley McChrystal labeled the district a bleeding ulcer. It was not until September 5 that the first Afghan police station was opened there. Thousands of Afghanis protested the plan of a Florida pastor to burn copies of the Koraneven though the church cancelled the September 11 burning. Some 10,000 marched on a NATO base in northern Afghanistan September 10, where NATO soldiers shot and killed at least one demonstrator. On September 11 hundreds demonstrated outside NATOs Bagram Air Field. Meanwhile, Afghan police beat back government workers September 8 who were trying to cash their monthly paychecks at the Kabul Bank, the countrys largest private bank. After both the banks chairman and its CEO resigned amid charges they had made off-the-book loans and investments, deposit holders withdrew more than $250 million in cash in a matter of days, prompting fears the institution would collapse. The political isolation of President Hamid Karzai continues. His efforts to convince sections of the Taliban to lay down their arms and open peace talks have produced few results so far. They have, however, spread concern among oppressed nationalities that suffered severe repression when the Taliban were in power. The Taliban are drawn mostly from the Pashtun nationality, Afghanistans largest. We feel betrayed by the president, said Mohammed Mohaqeq, a member of parliament from the Hazara nationality. It seems that what President Karzai pursues now is the Talibanization of Afghanistan. The president is also losing ground, the Washington Post reported, with sections of the Ulema Council, a group of 3,000 Muslim clerics who receive funds from the government.